A historian is carrying out research in an archive room. He is taking notes and recording details while an archivist brings him documents on mining towns, block towns designed in the 1960s to house coal miners. Schools, shops, homes for engineers…all of this begins to appear on the table in front of him in the form of maps. While the statistics and historical testimonies bring to life a forgotten episode of social history, one entry describes a tragedy that occurred in the family of the researcher. A child had died, right there in one of these engineers’ homes. 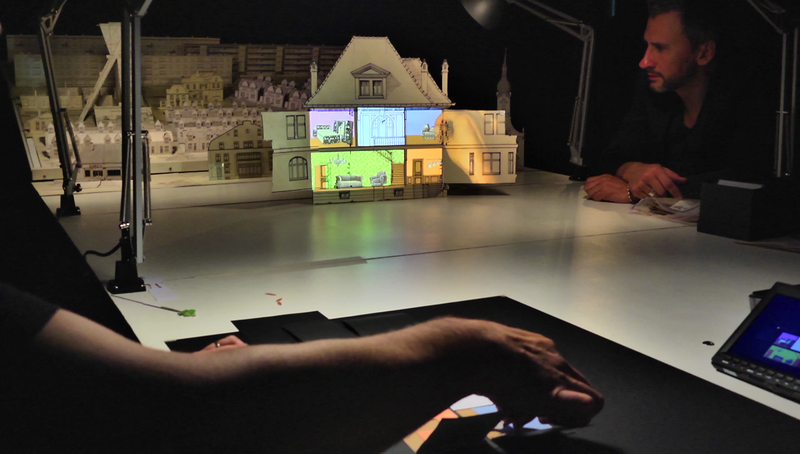 The documents come to life through the text, the sound, the video and the wordless relationship between the character of the historian, played by Benoît Faivre, and the archivist, played by Tommy Laszlo. A faithful and lyrical adaptation of the account written by the historian Philippe Artières, who described his work as: “uniting the living and the dead” in order to help those living to live. 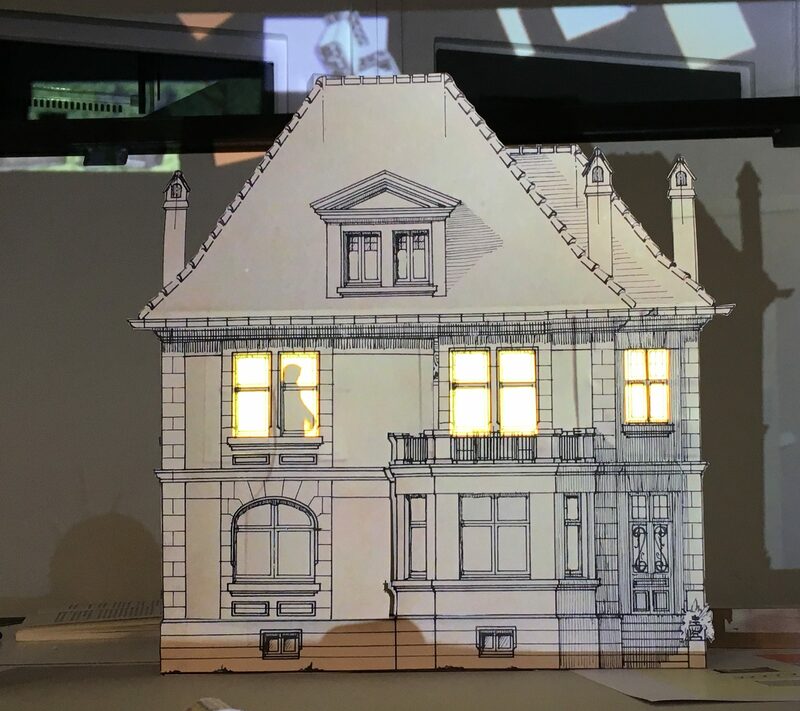 This short format performance came about as a result of a residence at the Moselle Industrial and Technical Archives Centre. Benoît Faivre and Tommy Laszlo were fascinated by the depths of the coal mines in the Lorraine basin, finding there a whole host of treasures. Their attention was particularly drawn to the thousands of plans put together by architects for the mining towns. 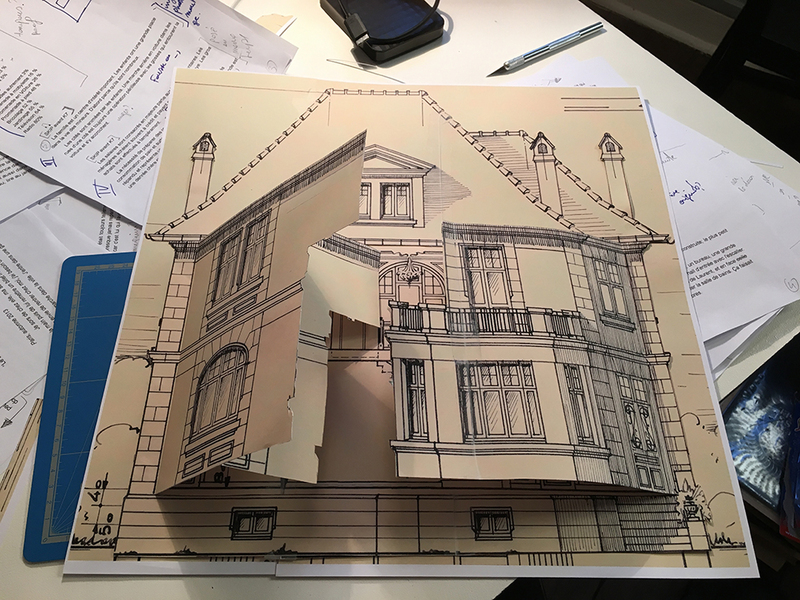 The artists employed the simple technique of folding, allied to a use of video, in order to bring these black and white documents to life, continuing on from the “raised paper” concept first explored in Villes de Papier. 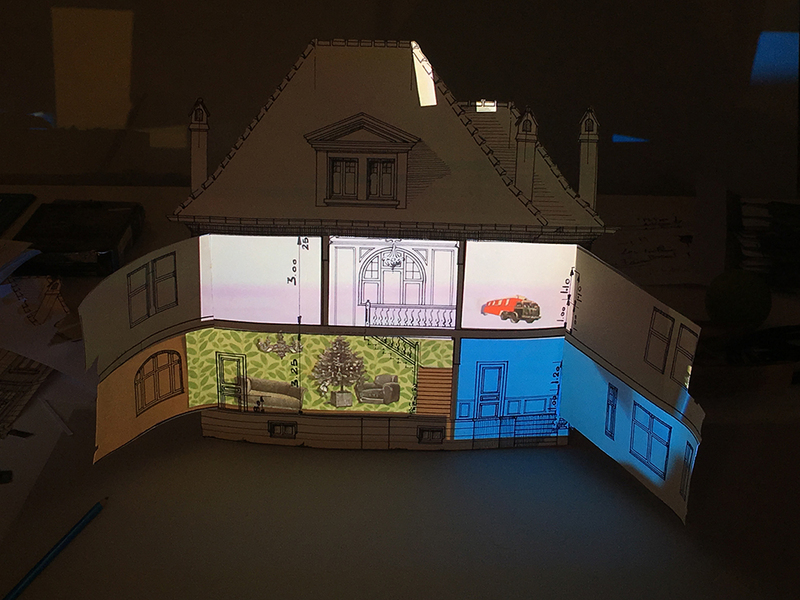 This time, using a technique involving video mapping, they were able to project colour images and silhouettes in such a way as to give the impression that the miniature houses were inhabited. As these archives come to life, they tell the story of how society gave birth to these towns – towns which continue to search for a sense of meaning, despite the mines themselves having closed. Benoît Faivre and Tommy Laszlo’s shared interest in these archives brought them into contact with Philippe Artières, a historian at the CNRS (The French National Centre for Scientific Research). Artières had consulted the collections on the mining towns in Lorraine while writing Au Fond (Editions du Seuil, 2016). In this personal account, the author opens up a dialogue between the archives of a mining town and family documents. The book alternates between stories of public life and stories of private life, allowing this moving account to explore two separate deaths – the death of an older brother and the death of the mine. 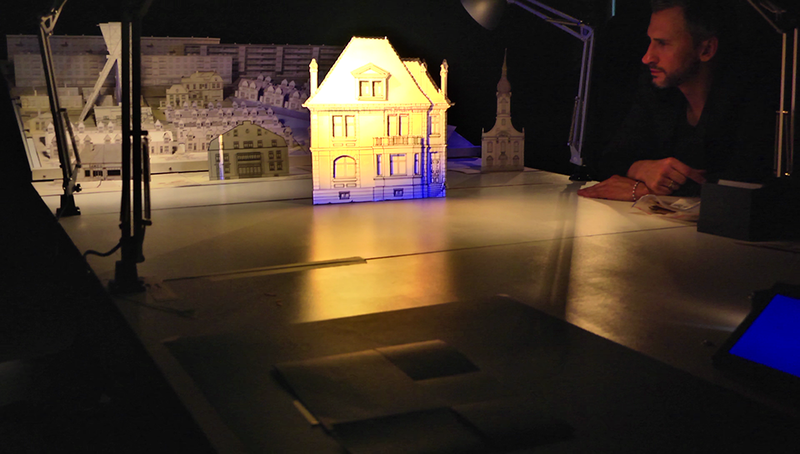 This is the first example of La Bande Passante adapting a literary text, while continuing their “Mondes de Papier” cycle, which is based around the concept of archive documents. Benoît Faivre plays the role of the historian, who starts to question the meaning of his research. In his role as the meticulous archivist, Tommy Laszlo is a silent presence, a character that might be thought of as alluding to the dead brother. 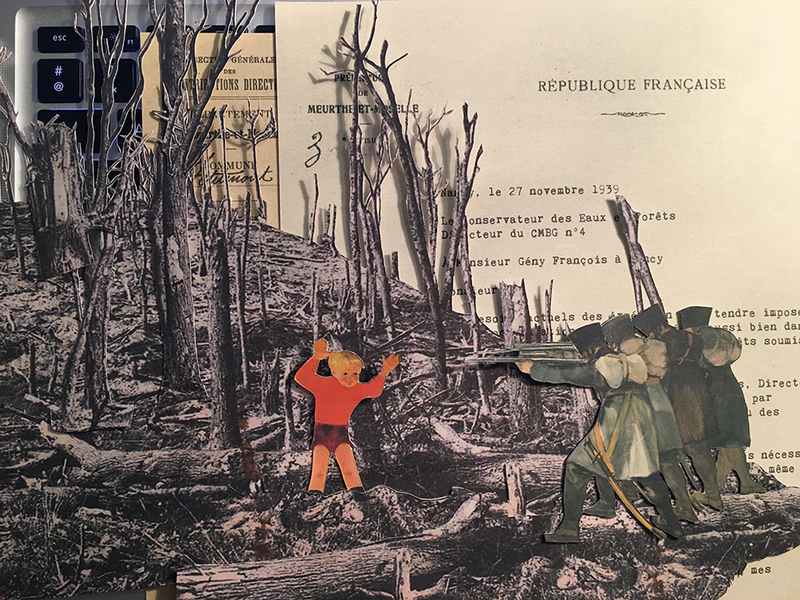 Generally speaking, the artists were able to identify with the work carried out by Philippe Artières: considering the archives as living beings and viewing historical research as a vital means of understanding the present.